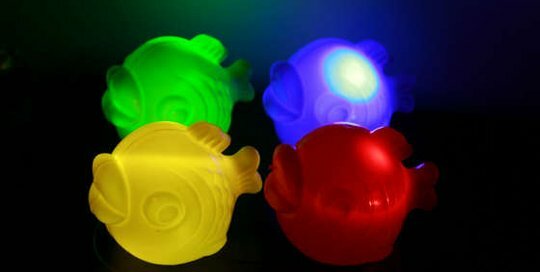 Instructables has an article on how to create a lightfish, also called LED-Swimmies: Highly lucid fishes. The artist Karl Klar did an installation in the public space, which was placed in the construction site of the new Ars Electronica Center in Linz, Austria. To vivify the flooded reservoir, 500 lucid fishes got placed into the see – plastic fishes with bright battery-powered LEDs in their inside. They got put into the construction site at the evening of the 16. September 2007 to illuminate the whole place. The colorful glow coming out of the reservoir integrated the building site in the city of lights. The fishes symbolize the transition from the natural state of the meadow, which was there the last hundred of years, to the new modern technical museum. Furthermore, it was possible to fish the lightfishes from the construction border using fishing rods with magnets. The fishermen and -women could take their booty with them as a trophy. This was possible in the night and 350 of the 500 fishes got catched by the audience. Check the article to see how you can make LED-Swimmies yourself.